For drying you can use the roach, bream and roach. 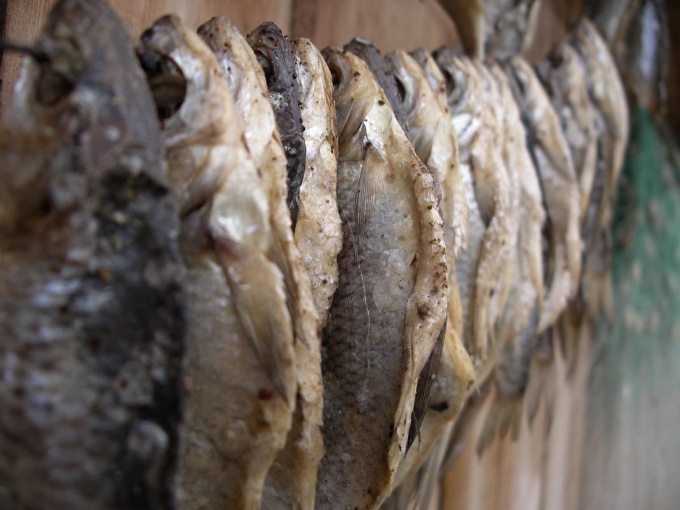 Freshly caught fish are immediately processed for drying should not be. First soak it several hours in water, then you can prepare fish for salting. Brine. Take one part salt to four parts water. Mix thoroughly until complete dissolution of the salt. Before the Ambassador fish nanizhite the twine through the eye. A bunch of fish rinse in cold water to ush away loose scales. RUB the fish with plenty of coarse salt. Grated salt fish lay tightly, belly up, on the bottom of the pan. 3-5 days, depending on the number of fish, bunches of fish, remove from pan. Put the bundles in a large bowl and rinse with water for hours of cold water. After this, the fish needs to be hung outdoors. Unfold it on the bundle so that the fish do not touch each other and hung out abdomen. Small fish need to jerk two weeks, the big – five weeks. If the fish length is 30 cm, salt, not cutting up, whole, and larger fish are best for pickling need to be cut. Summer jerk fish is not recommended, so how fast is the rancidity of fish oil.